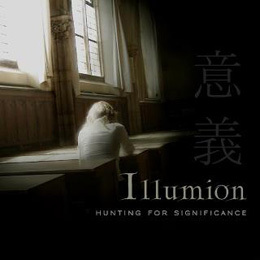 Released through Progress Records, Hunting For Significance is Illumion's debut release and the brain child of Eveline van Kampen, who not only plays all the guitars on the album, she composed all eleven tracks. Whilst that would therefore suggest that she would steal the show throughout, her understated and intricate playing actually underpins everything else that is going on, although there are many occasions where her playing shines. In fact vocalist Esther Ladiges who came to prominence when she won a web competition to sing on one of Arjen Luccasen's Ayreon project albums is the focal point on much of this gently symphonic, progressive rock album. Ladiges possesses an interesting voice with a lot of depth, however there are times where she comes across a bit like Kate Bush without the "wow". Having said that the vocals on "Into the Labyrinth" or "Metamorphosis", which sees her mix her Bush leanings with a bit of gentle Tarja demonstrate both the variety and emotion that this style of music requires to hit home. Both of the afore mentioned songs are among the strongest on show, "Into the Labyrinth"; in particular shines brightly with a strong Marillion circa Fugazi feel, where "Metamorphosis" has a more grandiose, mysterious approach mixing Ladiges vocals and van Kampen's guitars beautifully with guest musician Annemieke de Boer's excellent keyboards and Peter H. Boer's pumping bass line. Lyrically the songs are inspired by a mixture of van Kampen's travels and books by authors such as Oscar Wilde, Franz Kafka, Edgar Allan Poe or William Blake and in truth can be a bit cumbersome and 'clunky' at times. A perfect example of this is the opening lines from album opener "Encomium" "Depurate the air with lies, Deracinate the trees with rice, Immoral poets devocalized, While perdition is at" which is too convoluted for my tastes. However when the words and musical performances do come together the results are really well worth consideration. "Prophecy" is one such moment where Ladiges seems more comfortable with the words and along with one of the simplest, catchiest riffs on the whole album has focus and drive that can be lacked elsewhere. The musicianship right across the whole album is impressive and tight, drummer Emile Boellaard certainly knows how to play for the song, avoiding any temptation to overplay and dominate proceedings, instead his performance is subtle without being plain and is a joy to listen to. That's not to suggest that any of the band over play their hand and credit is also due to keyboardist Eveline Simons who's playing holds the whole thing together with gentle melodies and interesting stabs which really enhances the overall sound. As debuts go, Hunting For Significance is a good effort, what I would suggest is more use of light and shade could have moved the songs onto the next level as there are not quite enough really memorable moments to stick in the mind and a punchier production could maybe have solved this issue. Too often you are left waiting for a stronger, heavier riff or more dramatic vocal. Not a fantastic album, but one that leaves me strongly intrigued as to what album number two will sound like.